For many years, implant-supported dentures have helped people missing all of their teeth to once again enjoy the pleasures of smiling, chewing and talking with confidence. But for many of these patients, reduced bone density necessitates bone graft surgery before dental implants are considered. Now, Dr. Madhav offers All-On-4 dental implants, which eliminate the need for bone grafts and will actually rebuild bone density over time. All-On-4 dental implants work just the way you’d imagine—four implanted posts support a full denture. Your jawbone is naturally denser toward the front of your mouth, so the implants are placed there for greater stability. The posts are also angled so that they’re able to support a whole arch of replacement teeth. Placing All-On-4 dental implants isn’t very different from the procedure needed with traditional implants. The four implants (some patients do require six) are surgically embedded in the jaw, and a lightweight temporary denture is positioned over the implants to protect delicate gum tissue during healing. Over the next few months, the implants fuse with the surrounding alveolar bone. Then, patients come to see the dentist in Plano and have the final restoration attached to the implants. 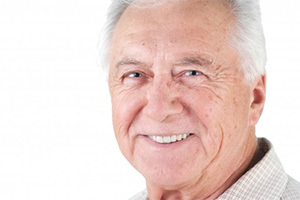 Would like to find out more about All-On-4 and other dental implants treatments to improve your denture wearing experience? Dr. Madhav would be glad to examine your smile, make a recommendation and help you decide on the restoration that is best for you.